Conversations with Successful Contemporary Women Writers… who are also Moms. I first met Reyna Grande through my PEN Center Emerging Voices Fellowship in 2010. She was a previous EV Fellow with two successful novels published, and I absolutely fell in love with DANCING WITH BUTTERFLIES, which follows the lives of four women folklorico dancers in Los Angeles (which explores interesting issues of Latina motherhood as well). As a young Latina beginning my journey as a writer, I felt that Reyna’s life story (she immigrated from Mexico as a girl who did not speak English, and went on to earn her MFA and become a critically acclaimed bilingual writer whose books are often assigned reading for K-12 and college classes in both the U.S. and Mexico!) and her beautiful books were personal inspiration… as if I’d met her at that point in my journey for a reason. Within a year, I’d given birth to my baby girl and found myself balancing between a writing career, teaching college English, and being a mama with two young children. And Reyna’s words during our EV Author’s night came back to me; she’d said that while she was in the midst of writing, she felt like a split mom, guilty for not giving her kids enough attention. Then, when she was finished with her current project and spending all her time with her children, she felt like she should have been giving more to her writing. I completely relate and am sure many of you mama writers can. Now, Reyna’s next book is being published this month, already to much critical acclaim and praise! Her memoir, THE DISTANCE BETWEEN US, chronicles her journey first being left behind in Mexico as her parents crossed to El Otro Lado (the other side) without her and her siblings, and then her eventual journey across the border herself. In light of Reyna’s continued success, I wanted to chat with her about how she continues finding a balance between her writer-self and her mother-self, especially as a Latina woman, with all that entails culturally. 1. As a Latina writer and mother, do you ever feel that you are breaking any barriers? Can you share any experiences you have with this? Sometimes I feel I’m breaking barriers by being a Latina writer. Although the road was paved for us by great Latina writers such as Sandra Cisneros and Julia Alvarez, there is still a long way to go in terms of having our work recognized by the mainstream. Sometimes I know my work has been overlooked because of its ‘Latina’ themes, but I like to stay true to my voice and write about what I care about. 2. How do you find the balance between mothering and writing? Do you ever find the lines crossing in interesting ways? Balancing the two is very difficult, although I do my best and take advantage of the time the kids are in school. I try to write as much as I can then. The way I see it is that my books are as much my children as my real children are. They need to be nurtured. They are also demanding and require attention. So I try to divide up my time between them all! 3. Was being a mother always a goal/desire for you, and was being a writer always a goal/desire for you? How does the reality of being a mother-writer compare with your expectations? I don’t think I ever thought of motherhood as a “goal”, not the way I saw becoming a writer as a goal. Motherhood was something I knew would happen eventually; I saw it as a natural part of life and my adulthood. Writing was an unsure possibility and it terrified me to think that it might never happen. Being both a mother and a writer has been very difficult for me. I often feel torn between the two. When I am deep into my writing, it is hard for me to turn off the computer once my children get home from school and switch gears from writer to mother. You know characters don’t know how to ‘clock out’ when your writing shift ends! If I give in to my writing I feel guilty for ignoring my children, but if I pay attention to my children I feel guilty for ignoring my writing. Juggling being a mom and a writer can be frustrating at times. 4. Did you continue writing while you were pregnant? While your babies were newborn? Did writing become any easier or more difficult once your children were school-age? When I was writing my first book, ACROSS A HUNDRED MOUNTAINS, my son was a year old. He still slept often enough during the day that I was able to write a lot and be able to finish my novel. As he got older it got more difficult. And then, when I was in the middle of writing my second novel, DANCING WITH BUTTERFLIES, I was pregnant with my daughter. My due date was January 22, so I made that my deadline to finish my novel! I worked like mad and I was able to meet my deadline, and after she was born, I spent several months revising. Again, babies are manageable because they sleep a lot. It was very hard to find the time to write my memoir because by then my daughter was running around and needed a lot of attention, but I would take her to a daycare for a few hours each day and I would write nonstop until it was time to pick her up. 5. Do your children ever read your work? And have you written anything specifically for them or with them in mind? My son read a few sections of my memoir as I was writing it, and we are now reading the final book at bedtime. My daughter loves to listen to the audio excerpts I recorded from the memoir. She practically has them memorized! I don’t write children’s books, but I wrote my memoir with my children in mind because I want them to know where their mother comes from. I guess part of me felt that even if I died tomorrow, my children can always find me in the pages of my memoir and be able to remember me. I have this fear of dying and not being able to watch my children grow. My daughter especially is so young still that for sure she would have no memories of me… somehow writing the memoir made me less afraid that my children would forget who I was. 6. Have you ever felt that your work might not have been taken seriously if it explored issues of motherhood and/or the Latina experience? Definitely not. I think that those are very profound issues that need to be explored and told. 7. Have you found that there are particular challenges facing mother-writers than those of other writers? What about for Latina writers? I think the main challenge for a mother-writer is finding time to write but also time to promote your work. Every time I get an invitation to speak at a college or conference outside of L.A. I feel elated to receive that invitation but a few seconds later the guilt comes at knowing that I will have to leave my kids for a few days. Also mother-writers have it a lot tougher of course because we are juggling two big responsibilities and are doing double-duty as nurturers–both children and characters need to be handled with care and given lots of attention. If that weren’t enough, being a Latina mother-writer is even harder. A Latina writer has to work twice as hard to get her work noticed! 8. What obstacles have you had to overcome in order to become a successful writer? Oh, boy, I don’t think there is enough space here to list everything! But let’s just say that my very difficult childhood prepared me to meet a challenge head-on, so I haven’t let anything deter me from my dream of becoming a writer. 9. Have you any advice to share with mother-writers who may be struggling to continue their craft or to find the path toward publication? What about for Latina writers in particular? My advice is to not give in to the guilt that comes at wanting to do right by your children and at the same time wanting to pursue your own dreams and desires. Try to find the balance and give your children the love and attention they need, but don’t forget about yourself: a happy woman is a happy mother, that is what I think. If you aren’t happy and at peace with your woman-self, then you will not be in the right frame of mind to be a good mom to your kids. So if writing makes you happy, keep writing. As for Latina writers, I think we are living in a very exciting time. Latinos are becoming the biggest ‘minority’ in this country, our voices are getting stronger. We have power and influence in different areas of society. Our writing is more important than ever. So keep writing. Lots of traveling! Having a new book out is a lot of work, but very exciting. I can’t wait to share my new book with my readers. Thank you so much, Reyna! We wish you continued success and all the joy you deserve! 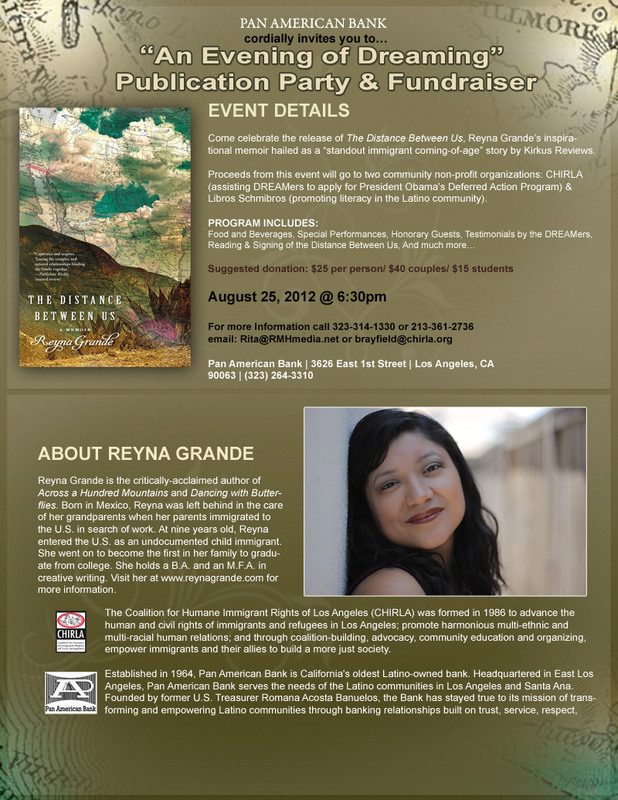 *Editor’s Note: If you are in the L.A. area August 25, 2012, please join Reyna for a publication party celebrating the release of her memoir!